Turn on Post, Answer and On comments in Post and Answer. You can click on the tag in tag cloud, or in the post, or in the Tag browser in the left menu and subscribe to it. F.e. if I click on Caché tag I can see email link to subscribe to this tag. 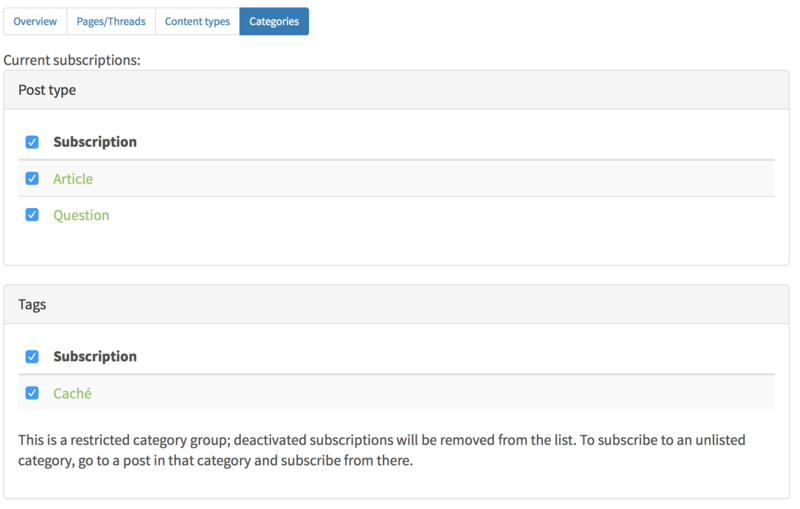 Later you can customize your tag subscriptions in the same Categories tab of Subscriptions. Groups have similar rules of notifications. Just pick a group, subscribe and you can unsubscribe in the Categories tab. To turn on the subscription, just click on the star in the left corner of the post to make it favorite and subscribe to it. And you are automatically subscribed to your own postings and to the posts where you leave the answer or comment. 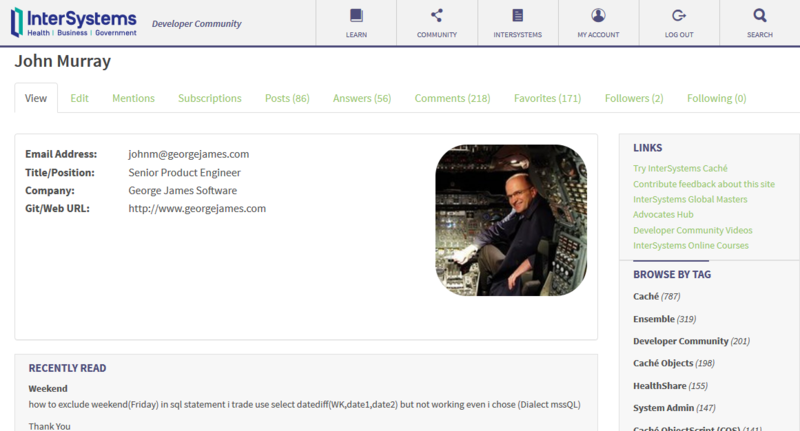 To manage all the current posts subscriptions open Subscriptions menu and go to Pages/Threads tab or Favorites on your member's page. You can Follow the member to subscribe to all the postings this member is doing: posts, answers or comments. E.g. I'm following Kyle Baxter so I'm getting the notifications on all his postings. You can manage your followings on your member's page (like on my one). And you can see who is following you as well. Sounds like the way it SHOULD work, however I'm getting multiple emails daily on an Ensemble topic I viewed but didn't subscribe for. No subscriptions in my account, no tags, nothing I can find to turn off. Any suggestions? Maybe an account reset or something? Thank you for the feedback, we will investigate that. 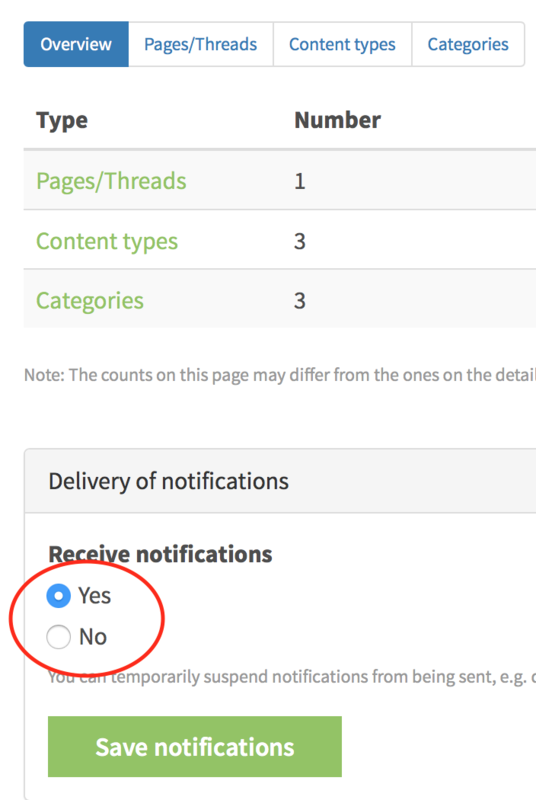 Delivery of Notifications from yes to no doesn't sound like it is really and option for me. I would like to receive notifications in regards to articles I have commented on and or posted. In looking at these instructions it seems as if I may be receiving all kinds of notifications possibly due to A Restricted category group. 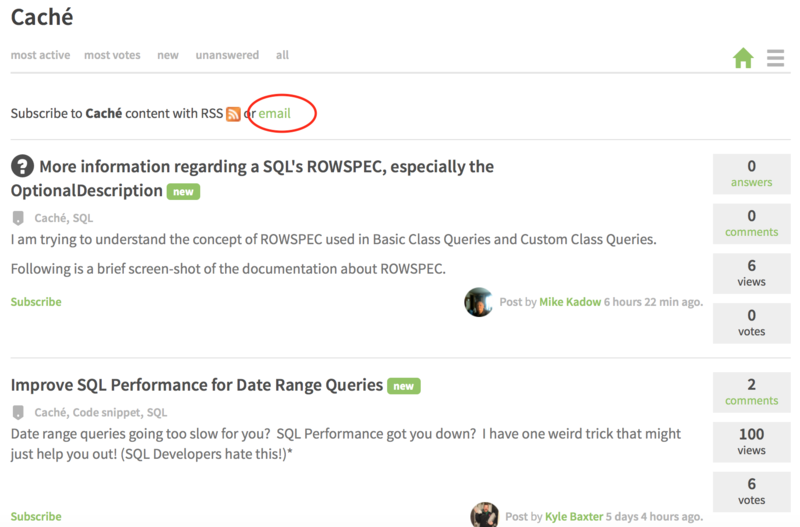 I tried going to a message (For istance https://community.intersystems.com/post/whats-best-way-doing-reports-zen-mojo )has 10 tags in it and when I click on each tag they all have something like "Subscribe to $tagname with RSS or email." Non of them seem to have an unsubscribe option. (I even tried clicking on the email subscribe button for cache but that ended up adding it to the Current subscriptions: Tags section. I have removed it from tags. 1. How can I figure out which restricted group categories I am in? 2. How do you actually unsubscribe from those categories. 1. General subscription to all posts, answers, and its comments. 2. 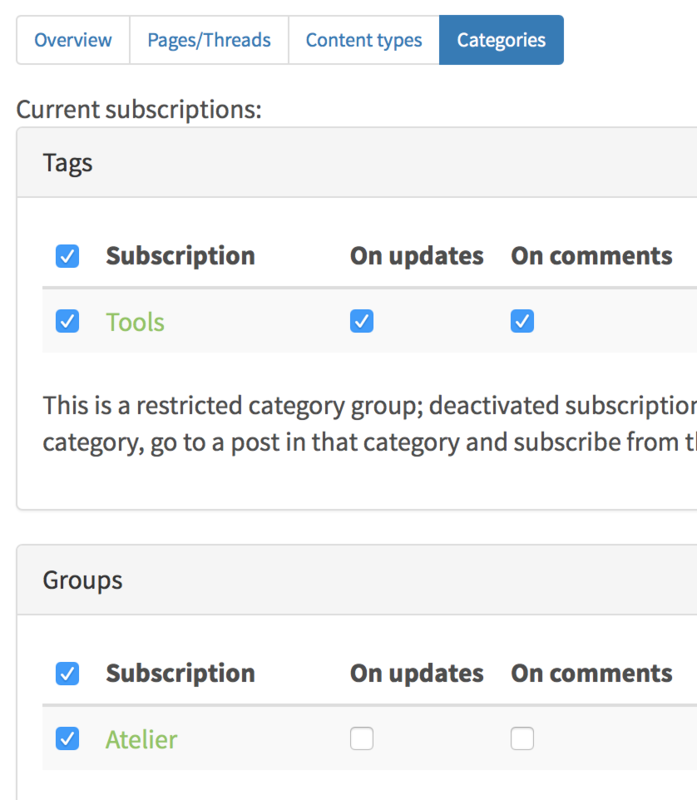 Subscription to Groups and Tags. You can subscribe to the Groups and Tags as you mentioned in your question. 3. Subscription to particular topics. If you favorited (star) the page, or answered/commented it, you are automatically subscribed to the page. You can do that in the settings, as listed above. Also with the latest DC release, we improved the notifications, so once you get the notification now, there is the related unsubscribe button which leads to a right place to unsubscribe from these type of notifications. I have been under 4 tabs (overview, Pages/Threads, Content Types and Categories.) 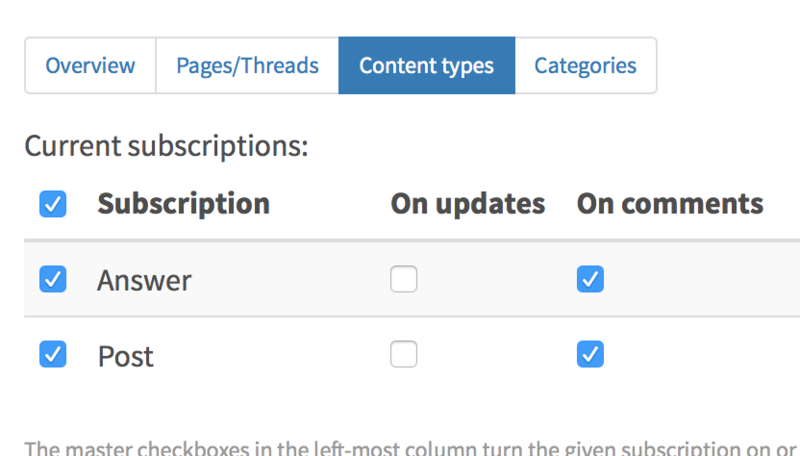 The only things I have ticked are on the pages/Threads page and are the overall subscribe checkbox and the On updates and On comments tick boxes for two threads I want to follow at this time. (this thread and one other. ) 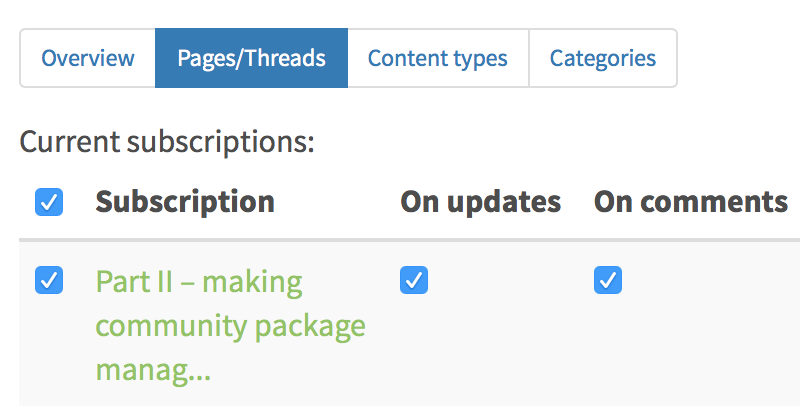 Under the Content type the tick boxes are all un-ticked (subscriptions, Answer and Post.) For Categories Overview it tells me I have 2 selected items but under Categories tab I have 0 Tags and The groups section tells me it is restricted and I do not see any tick boxes on the page. Just before your update I received and email entitled "[ISC-DC] Encoding issues ..." which is an issue I am not explicitly trying to watch. When I click on the Purple Unsubscribe at the very bottom of the email. I end up at the Subscriptions -> Pages/Threads page again and there is no line item for the Encoding Issues thread, only the two threads I want to follow. For Categories Overview it tells me I have 2 selected items but under Categories tab I have 0 Tags and The groups section tells me it is restricted and I do not see any tick boxes on the page. 2 for categories it is a bug we are fixing now. Every member has it if there is no any subscription. Just before your update I received and email entitled "[ISC-DC] Encoding issues ..." which is an issue I am not explicitly trying to watch. When I click on the Purple Unsubscribe at the very bottom of the email. It seems it's a bug. We'll try to fix it. We fixed the bug, you should not see any phantom categories now. Sorry for the inconvenience. Please confirm that the flow of messages has been stopped. That's a bug, which shows +2 categories for every member now. Point "No" for "Receive notifications" setting. The bug was fixed, subscription tabs should show the real numbers of categories. 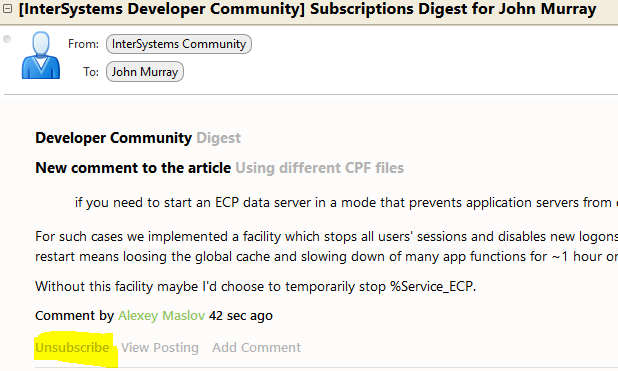 Updated the article according to new notification types and changes in the Developer Community notification system. Was it supposed to take me somewhere on the Subscriptions tab? Yes, it's a bug, John, thanks! Filed and would be fixed soon! Something causes me to receive empty digest email mesages. 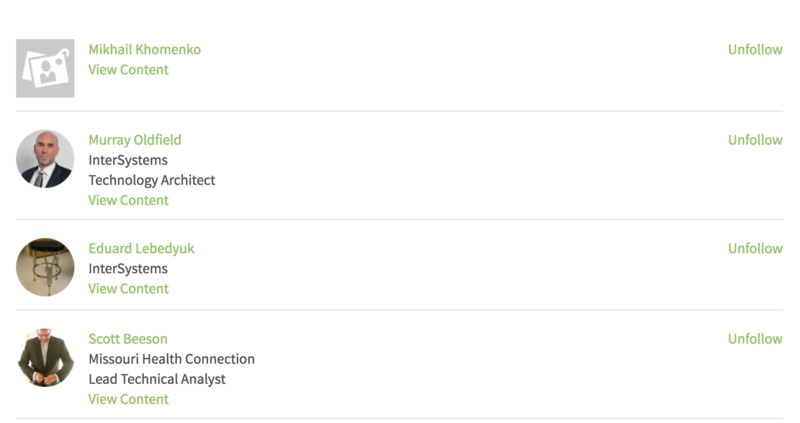 for example latest message (id <E1eJmz5-0004Tw-Cn@ded-12073.prod.hosting.acquia.com> ) has no content at all.